I’ve been posting these blocks of my current quilting project on Facebook as I finish them but here they are all in one place. These are the individual blocks of the month from 2013 Jinny Beyer block of the month quilt – Solstice. C bought me the kit for my birthday last year and I was so hoping to work on just one block a month as they got emailed out to me. It seemed like such a reasonable goal. Unfortunately, I got carpal tunnel with the pregnancy and ended up not being able to sew at all for most of my confinement. This was very devastating – being cooped up at home with time on your hands and being expected to loll about on the couch watching TV and NOT being able to craft! The other obstacle with this project which I now know I should have tackled differently is that at the very beginning of the project, before the first block, Jinny sent out the in between block pattern which is a basic log cabin with a fussy cut internal square. You have to make 12 of them and the instructions suggested making them up whilst you wait for the first block. I took that to me, finish these before you make the star blocks. And that would have been well and good had I been machine sewing and not hand sewing because 12 log cabin is actually more than 1 month of hand sewing. And it took me a long time to let go of finishing these before starting the project. (I’m still sewing these damn log cabins!). But I’m very proud of myself for wading in and attempting this project. Yes I made mistakes on the fussy cutting but making mistakes and having a quilt is much better than never starting for fear of failing, I ended up buying some extra fabric for the fussy cutting and now I can cut away with error room to spare. And the fussy cutting – cutting out exactly the same diamonds etc across the fabric to produce the extra patterns when sewn together. I’m thoroughly enjoying this process. It requires precision and exactness but the payoff is amazing. I’m hoping to do this by myself in other projects when I’m finished this one. And!!! 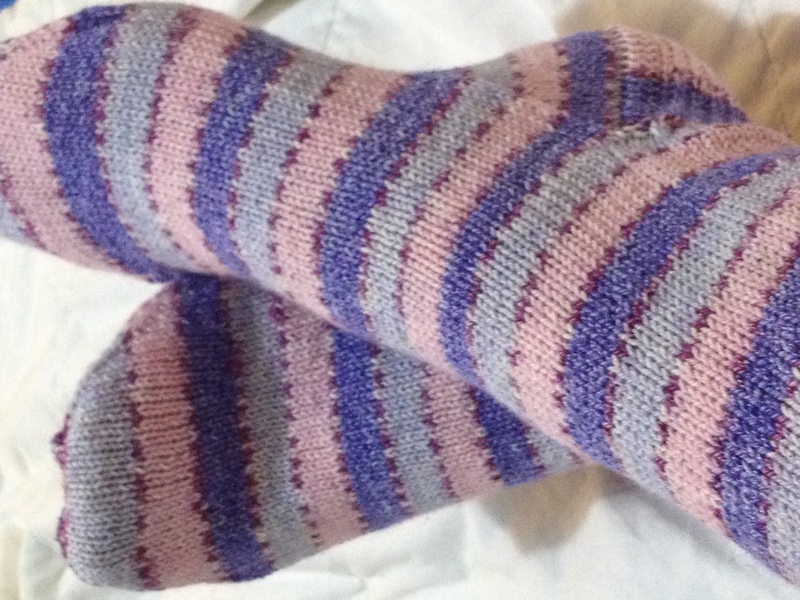 Because the socks in 2014 project plods along, here is Sock Pair # 2!!! A gift, so clearly not my size! These are made from Blue Moon Fiber Arts, Rocking Sock Yarn, with a Mille End in mediumweight. I’m not sure I’ve knit in medium weight of theirs before and I was surprised by how much leftover yarn I had even with making these socks in a few sizes bigger than mine. I love this colourway so the baby is getting a pair of socks from the leftovers! Thanks to those who left feedback on my craft post of anguish. I am terribly behind at answering comments. I took all your advice and packed up and put away the Charm Quilt project. 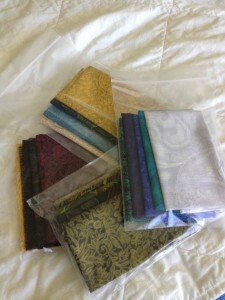 I packed up all the pieces that I had laid out and put them in a ziplock back and made a box just for this project. And that alone made me feel so much better. I’ve got a few pieces of that project still out on my sewing table – a few of the hexagons all pinned and ready to go – and some of the scraps. I’m mostly just mildly contemplating them from a distance. I feel like I could finish them off so they’re still out. But I am also very aware that I might feel completely better if I just packed them all up and put them away for now. Of course as soon as I did this, another little batch of fat eighths I’d ordered from a Jinny Beyer sale as a reward for something I finished came in. I took a photo of them and then popped them in the box as well. I’ll figure out what I’m doing with all that another day. Tansy says I always have this panic and I always move in cycles. I dunno though – this quilting thing is pretty new. 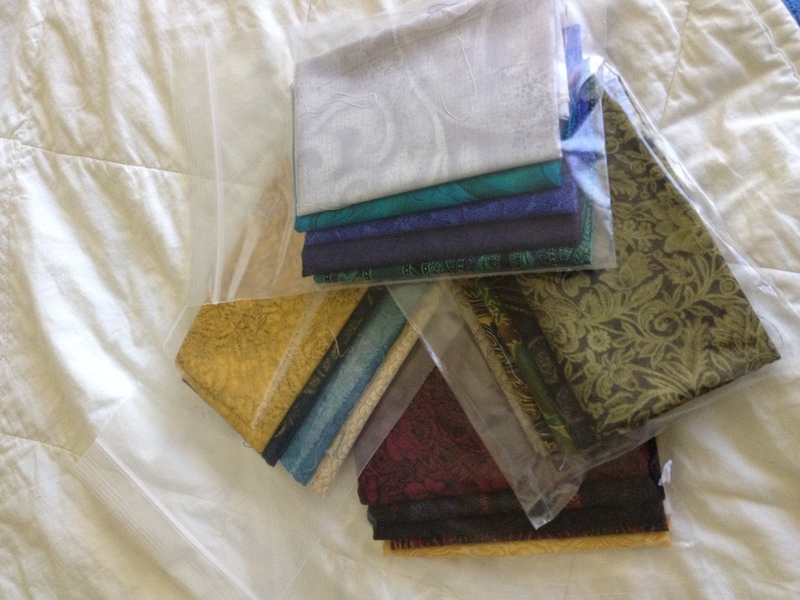 I only really started collecting fabrics just as my relationship with my ex was breaking up. So – oh. What’s that? 5 years ago now. Hmm maybe it’s not that new after all. Maybe I should just chill out about this and let go and let the cycles happen on their own. This forcing business only makes me feel bad anyway. It’s just that I have so many beautiful projects that I want to get to and I also want to actually finish the ones I have started. Anyway. This is not the point of this post. In any case, this time round, I really want to hope to believe that I can somehow be immersed in two crafts at once. Just like you can be immersed in two books at once. Oh. Nevermind. I took up some very excellent advice from Sim in the comments to my last post. She suggested that I audit my projects. I’ve only partly started this. I’m hoping to have finished it by the end of the week. However, this exercise was very interesting because I found where all my sets of DPNs (double pointed needles, come in sets of 4) were. Yes, they were in various stages of different pairs of socks. I decided that what I really want to focus on is starting and finishing the socks from the Cookie A’s sock club before the next skein of yarn comes in. So I went in search of the right needles. I found them in a sock project I had stashed in C’s glove box for those times I’m with him and we’re driving somewhere (we live 45 mins to an hour from stuff). I was maybe 25% away from finishing the pair. I’d started them on a couple of days field trip in the last job, oooh what? Last June? Last October? Yes, well. I pulled out the project and assessed it. It was close to being finished but very quickly, I also discovered that the second sock was a little bit shorter than the first – I’d put the heel in too soon. So I ripped back the half of the gusset and the heel and started over. I was a bit annoyed at that, creating more work etc, but the stripes, they didn’t match and I’d made a point of casting on the second sock exactly at the right point so that they would. And it would only annoy me every time I wore them if I didn’t fix them now. What’s an extra day of work compared to be annoyed every time I wear them? These socks wear really well – they are a commercial self striping sock yarn and about 15% nylon so they machine wash and wear great. The first pair I made with them, something like 8 years ago, still look fantastic. 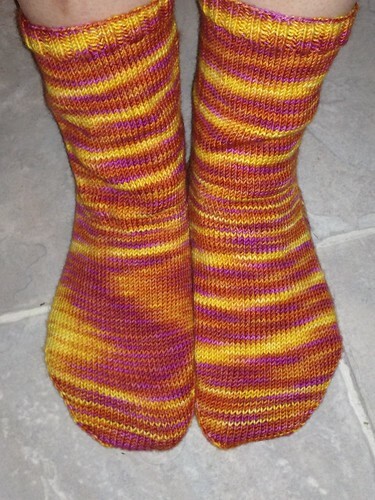 So in summary, I ripped back the sock to almost halfway, reknit it and finished these off over the weekend. A weekend in which I was out for most of Saturday and did various work things as well. A couple of hours and a new pair of socks. Makes me eye off the other socks in various stages on the needles. How long would it take me to have all new socks before winter? I suspect some of this has come about because I am so used to knitting for other people. I’m not sure why I am like that for knitting but a vast majority of what I have knit I have gifted away. And that sort of taints how you feel about it, I think. I mean, I love knitting and it might be that I am more process than product focused. Thus as long as I am knitting, I am happy. And how many of any one craft thing does one person need? Etc. But at some point, if you never enjoy the spoils of your labour, you must lose enthusiasm. So, whilst I do have a list of projects I want to gift this year, I think I really need (and I think I already had done so?) to set aside this year and craft primarily for myself. You know, til I have too many hats, scarves and socks etc. I used to read a lot of knitting blogs and knitting socks had just seriously taken off in the early 2000s. I used to watch as bloggers would knit themselves pair of socks after pair of socks and wonder how many pairs one person needed. They would casually say that woollen socks wear and the heels go first and some would even say they threw their socks out when they got holes. I guess back then my Crohn’s Disease was pretty made and as I ran a constant fever, I didn’t wear the socks I made for myself that often. Mine didn’t seem to wear out – I guess cause I didn’t wear the ones I did make for myself but also because I gifted a lot of pairs that I made. I have noticed the heels do wear first. But the fate that my hand knitted socks seem to perish to is the shrinking of the washing machine. No matter how careful I think I am being, socks get into the washing! 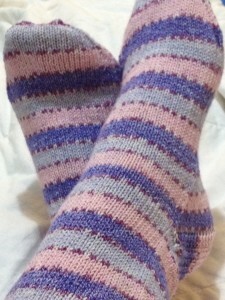 I had a lovely ribbed pair I made from Socks that Rock in something like Ruby Red which shrank soon after I made them. I gave them to my sister a couple of months ago – she has much smaller feet but I don’t know if she wears them. My latest tragedy is the discovery this week of this pair’s shrinkage/felting. (Thumb included for sizing) I’m sad to see these go and feel they deserve a bit of a eulogy. 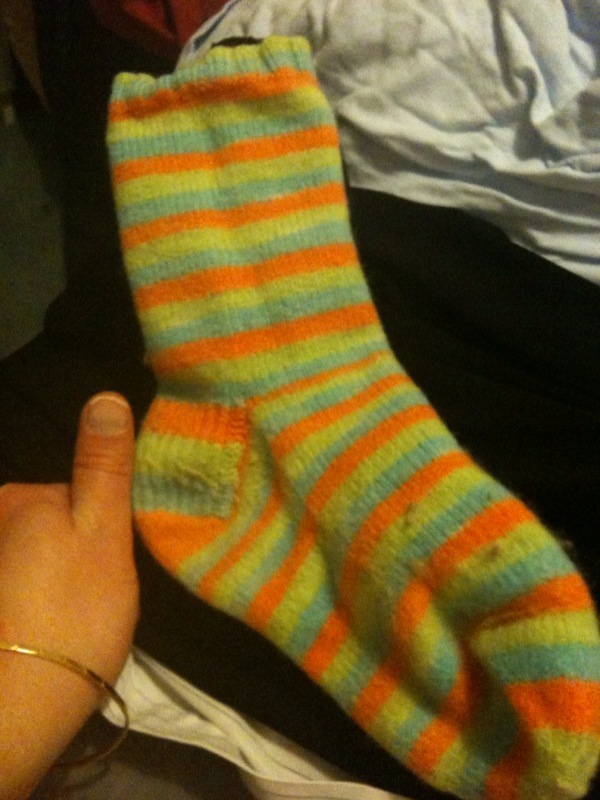 These were knitted from my very first, and most prized, skein of Vesper Self Striping from Knitterly Things – hand dyed, self striping and all the rage probably in 2003. When she’d upload new skeins to her shop, you had to be online and buy them immediately or else they were gone. I think I never managed to buy the colourway I secretly longed for but I really really wanted to try the self striping thing so I bought what I could. This skein. Prized but yet I can’t remember the colourway (ha! Excellent email filing tells me it was “Sweetwater” and I bought it in 2006) and the colours are not quite my thing so I rarely wore them. And now they are gone. I loved you socks, for the experience you offered. I’m sad they’re gone but on the other hand, they were fun to make, I did love wearing them and now … now I don’t need to feel so bad about making myself another pair to replace them.